In a time now long ago, when the term 'political correctness' hadn't yet been invented, auto manufacturers were waging a horsepower war. 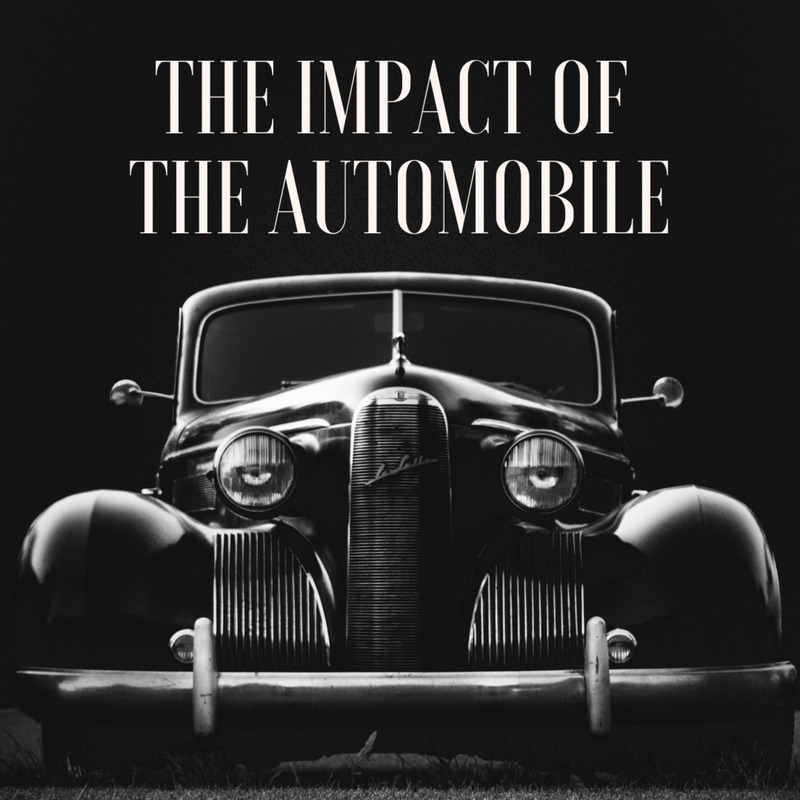 As a result, cars were pouring out of the factory doors with such huge power capabilities that any lapse of concentration on the accelerator by the average driver resulted in him being up a tree before he could even realize what had happened. Historians generally agree that the Oldsmobile Rocket 88, first produced in 1949 for a post-war public that wanted speed and power, was the very first muscle car. There was nothing around that could match its 303 cubic inch V8, and it went on to win eight of the ten NASCAR races that year. We then have to go to 1955, when Chrysler took over the NASCAR reins with its C-300. But then we go to the early 1960s as Chrysler, Dodge, and Plymouth (Mopar) compete with Ford as to whose car can get down the drag strip the fastest. The 1962 Dodge Dart with its production 413 cu inch engine could get through the 1/4 mile in a fairly staggering 13 seconds at over 100 mph. Let's take a breather here and have a think about this. The 2015 Ford Mustang goes through the 1/4 mile at 12.8 seconds. So 53 years ago, a Dodge Dart on fairly skinny tires could go down the strip only 0.2 of a second slower compared to a newer Mustang. By 1964, things were really starting to go wild in Detroit. 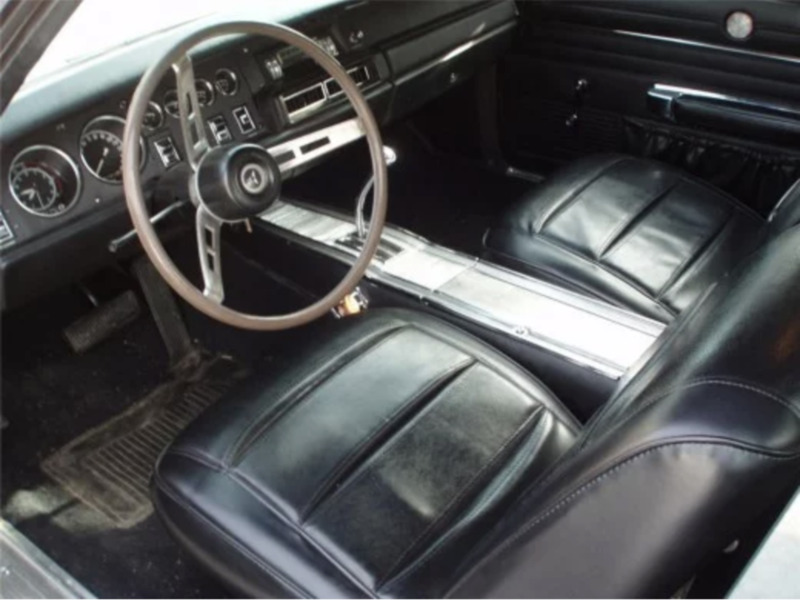 Chevrolet had the SS, Pontiac the GTO, Dodge the Polara 500, Plymouth the Sport Fury and Ford released its 427 cu inch engine in response to Mopar's 426 cu inch. There's no argument that the 1960s was the best decade for American car design ever. The top three—Mustang, Camaro, and Challenger—are still be recreating retro's from that era. It's amazing that we're nostalgic for a time so long ago. I guess the 60's stood for prosperity and freedom, two things sadly missing today. Okay - Let's get going with a list of the best 1960s muscle cars. There's no particular order going on here. 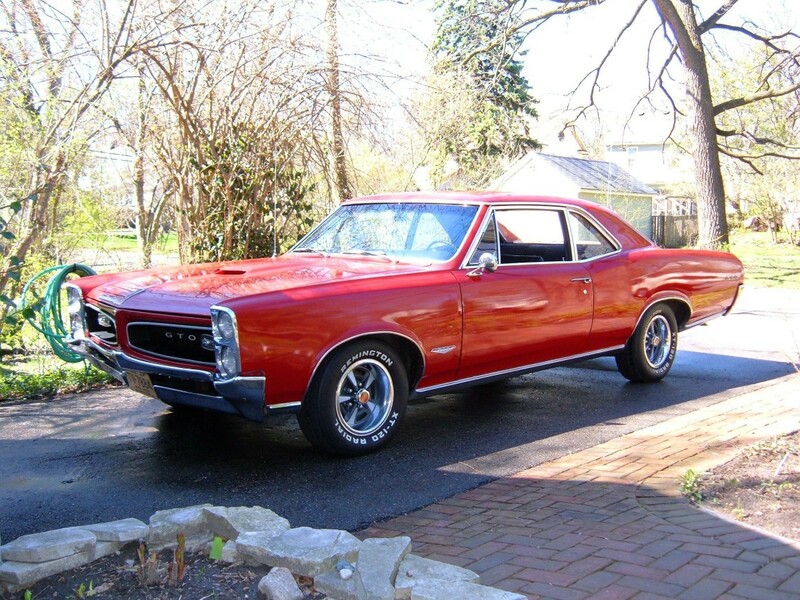 The 1964 Pontiac GTO lead the muscle car pack and is regarded by many as the first American muscle car. As I said before, the honor for the first goes to the 1949 Oldsmobile, but the GTO was the first out of the blocks to be well priced and widely available. General Motors had a very conservative Board in the 60's and banned its divisions from rocking the boat with cars like the GTO, so Pontiac designed it in secret and then approached the Board with a stack of dealer orders, in fact over 5000. Pontiac's Chief Engineer, John DeLorean and fellow engineers, Bill Collins and Russ Gee found that by installing the 389 cu inch V8 into the mid sized Pontiac Tempest that they suddenly had something fairly wild. 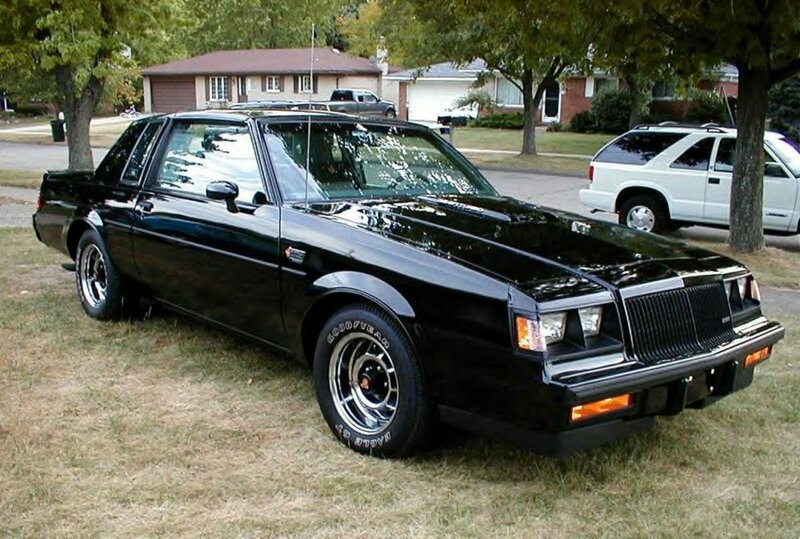 The Board had no choice but to produce it and it turned GM around from an old Nanny look to something that the new generation couldn't get enough of. The GTO was actually marketed through the Pontiac Tempest. So, if you wanted one you ordered a Tempest but with the GTO option pack. So your Tempest was rebadged as a GTO. The base cost was $2556. But then for an extra $295 you got a GTO with a 389 cu inch V8 with 325 hp. 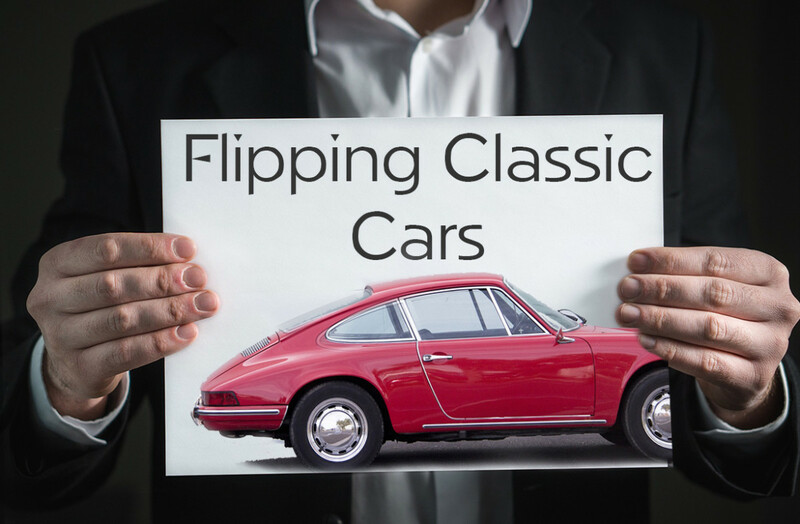 You could then opt for a four speed manual transmission, tachometer, custom sports steering wheel and you could also go another $115 and get the tri power, triple carburettors that got that horsepower up to 348 and gave you a 0 to 60mph time of just 5.6 seconds. That's fast. 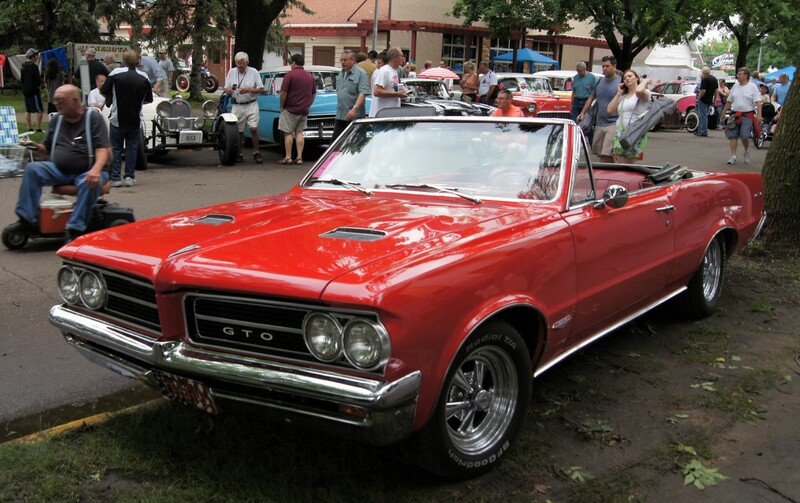 GM assumed a production rate of 5000 GTO's for 1964 but in Pontiac's history of car production, 32,000 were produced. Even more would have been sold if they had the production capacity. Predictably, the GTO got bigger and fatter and more luxurious as its owners got older and wanted something more like an armchair than a lightweight demon and so by the time that 1974 came the Pontiac GTO was all over as the appeal for American muscle cars was waning and stringent Government lead safety and emission regulations were taking hold. I'm giving this special mention because in my opinion the '66 GTO was the best looking of all the GTO's. This was the year of the 'coke bottle' look with kicked up rear fenders. It was copied across all manufacturers. Engine and transmission choices remained exactly the same as for the previous year and it was only 3 inches longer than the 1964 GTO. There was a new option called the XS which was a factory ram air set up with a new 744 high lift camshaft. If you ever see one of these for sale, don't hesitate, just buy one because they only made 35 with this option. 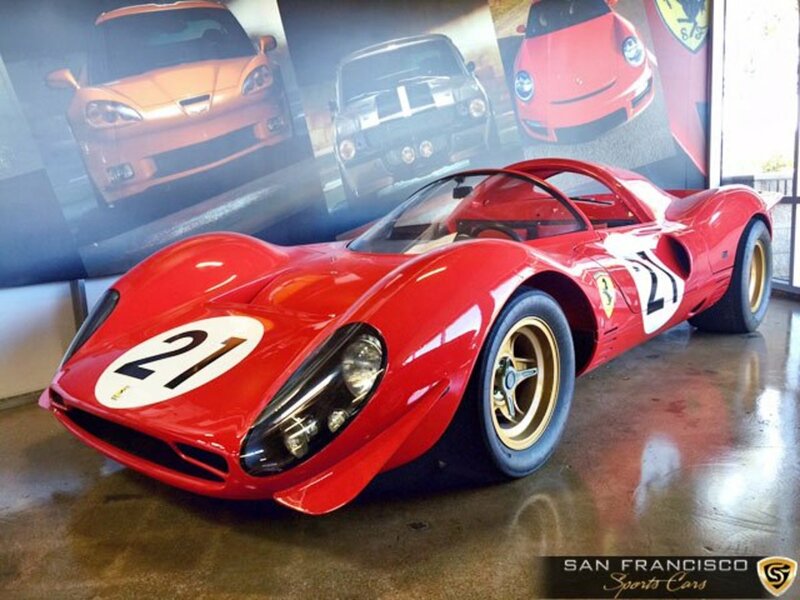 All in all 96,946 GTO's were made in 1966. More than any other GTO production year. 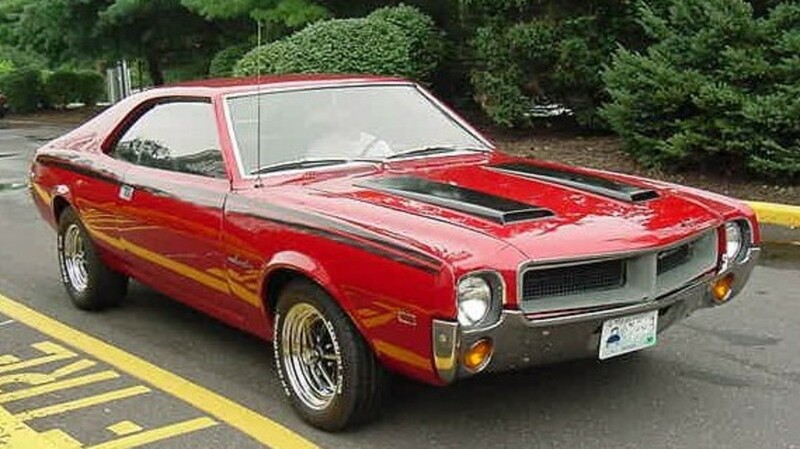 The youth market called it the Goat ( because a goat will eat anything), as it's still known today, even though Pontiac advertising tried extra hard to advertise it as the GTO Tiger. In Chevrolet lingo, SS stands for Super Sport. The term was adopted right through their model range, so there were even Impala SS's, along with Camaro's and Malibu's. Like the 1966 Pontiac GTO, the 1967 year of the Chevelle saw the introduction of the coke bottle rear fender look. The 396 cubic inch V8 was upped to 375hp late in 1967 and buyers had the choice of seven different transmissions. Five different manual boxes and two automatics. 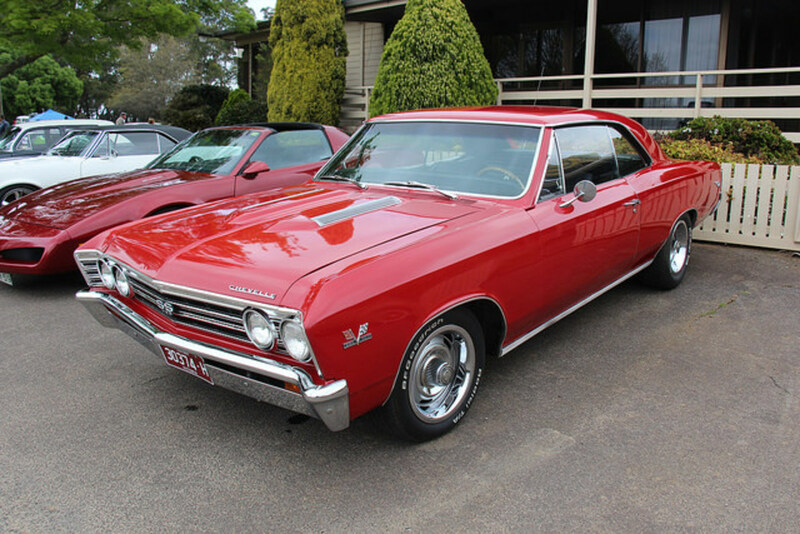 If 1967 you had $2825 burning a hole in your pocket, then the Chevelle was all yours. 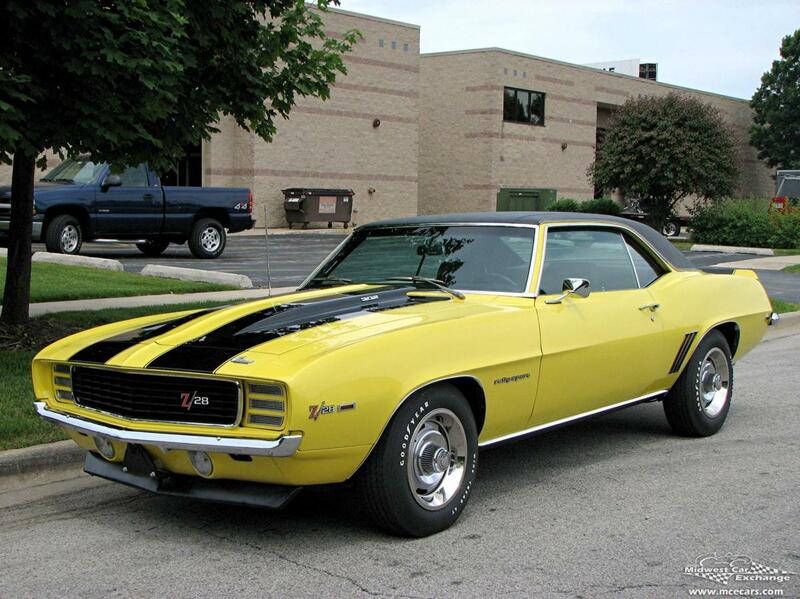 Hundreds of dollars cheaper than any other muscle car of the period. You did have to add a little for options. though. An extra $196 got you the 396 and Strato bucket seats were an extra $110. But with your 396SS you could glide quite comfortably past the 1967 390cu inch Mustang down at your local strip in a total time of 14.9 seconds. Zero to 60mph was taken in 6.5 seconds. The downside was that you were using fuel at the rate of 9 to 13 mpg. But gas was cheap in those days so who cared. Design for the 1968 Coronet was all new and it came in seven different models with hardtops, convertibles, sedans and station wagons. Pricing started at $2500 for the sedan. But forget about the sedan - The Coronet R/T (Road and Track) came standard with a whopping 440 cubic inch Magnum V8 with a four barrel carburettor offering 375 hp. 150 mph speedometer, vinyl bucket seats and bumblebee stripes around the rear. 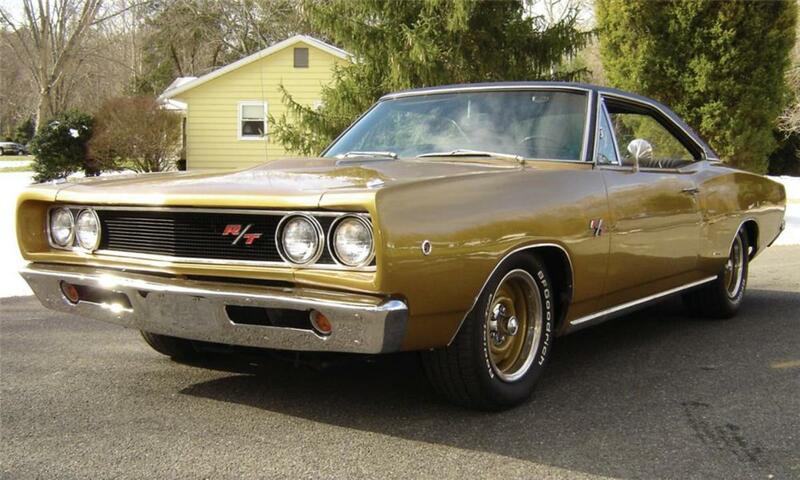 Even quicker though was the 426 cu inch Hemi version that went into only 226 Coronet R'T's that year. With 425 hp you could wreck a pair of rear tires in minutes. Zero to 60mph took only 5.3 seconds and it had a top speed of 140mph. All for $3500. 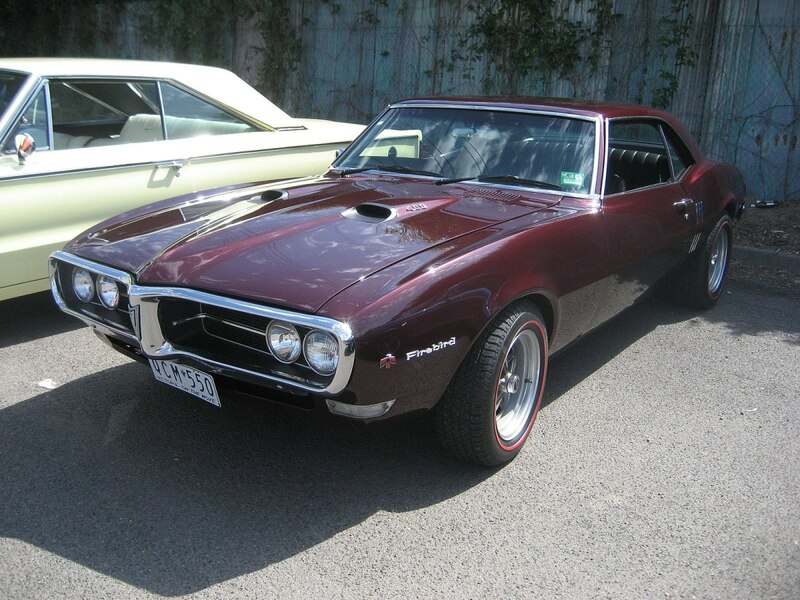 Pontiac introduced the Firebird in 1967 through its cousin the Chev Camaro. They really made the best use of any muscle car with regards the coke bottle rear fenders and still look totally stunning today, 48 years later. For 1968 the 400 cu inch engine from the GTO was available with 325 hp. But you could opt for the 'ram air' which gave you functional air scoops, a different camshaft and stronger valve springs. This was a pretty expensive option at an additional $600, so few were sold. Performance was good though, not much between this and a same year Camaro Z/28. Quarter of a mile was all done in 14.7 seconds, 0-60mph in 6.2 seconds. Firebirds were roughly $200 more on all models compared to the Camaro. Camaro's outsold them two to one. Very limited production for these Mustangs. Only 5000 were made in 1966. They all came standard with the Solid Lifter 289 cu inch V8 with 271hp. The very same engine that Carroll Shelby stuffed straight into his GT350 Shelby Mustangs. So basically these were a poor mans Shelby. They really weren't a lot slower either. The base Mustang 289 V8 was stock with 200hp so by Ford adding higher compression, a four barrel carb instead of the standard 2 barrel and solid valve lifters, this all added up to an extra 71 hp. So, you didn't have to do a lot to these small blocks to increase power by 40% or so. In fact, race versions were throwing out 350 reliable horsepower. The GT option pack also included front disc brakes, four speed manual box (instead of the three speed), quick ratio steering, chromed dual exhausts that backed out through the rear valance panel, built into the grill, twin fog lamps and five purposeful round dials in the instrument panel, in place of the standard Falcon instrument panel. You got all this including that glorious engine for an extra $276.00. 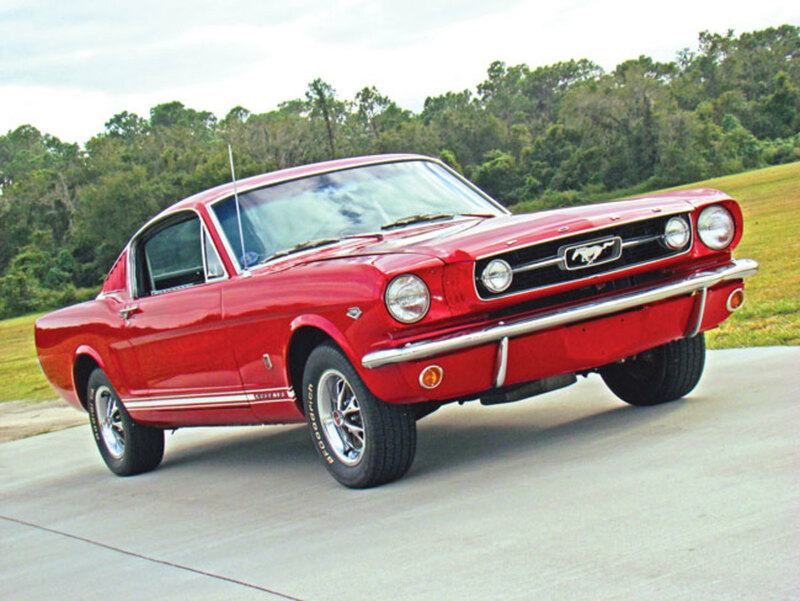 All up Ford produced 13,214 K Code Mustangs between 1965 and 1967. You can still buy one today. A good one can cost in the $40k mark. But it may very well not have its original K-Code engine or drivetrain. Also, be very wary of fakes. There's quite a lot online for you to be able to tell the difference as over the nearly 50 years since these first appeared, many have been made to look like K-Codes. Dodge were pretty late to the party with this one as it was meant to go up against the Mustang and the Camaro. The Challenger became famous overnite with the release of the movie 'Vanishing point.' The main star, Kowalski, evades cops from Colorado to nearly San Francisco, where he's destined to deliver the car he's driving, a white 1970 Dodge Challenger R/T 440 Magnum. If you've never seen this film, download it or borrow or buy it. Yeah of course it's aged but it's actually got some fairly strong social commentary going on as well as a car chase. These Challengers came out with a range of hot rod engines. First up was was a 383 cu inch 6.2 litre Magnum V8 rated at 335 hp. But you could order it also with the 440 cu inch, 7.2 litre, six pack (that's a trio of 2 barrel carburettors) which gave you a race car motor for the street with a 4 speed hurst stick and 425 hp. With this engine, the 440 could go through the quarter mile in just 13.4 seconds at 107 mph. In 1970 tires were nothing like we have today, in fact, radial ply tires were a fairly new innovation, so, a quarter mile in 1970 was run with a complete loss of traction for the first 1/8th mile. 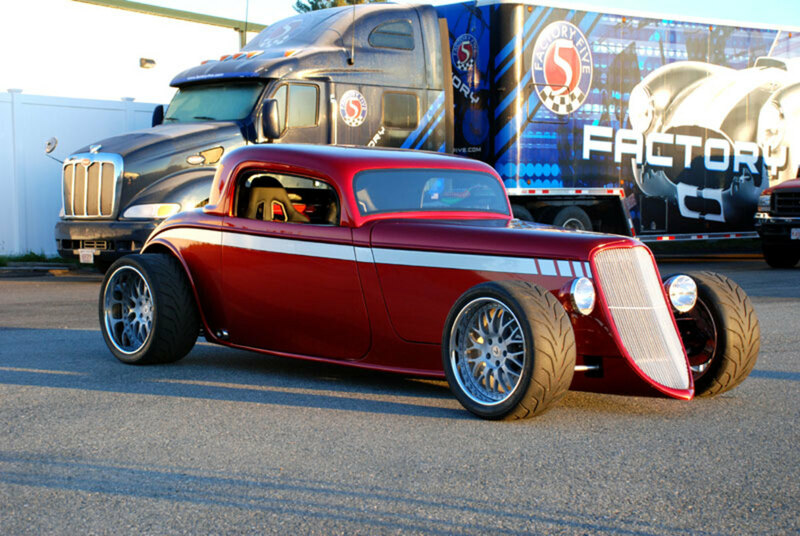 Recently 'Car Life' ran a 440 down the strip with ten inch slicks and it came through in the low 12's. A true blooded race car in street clothes, the Z/28 was designed to compete in the SCCA Trans-Am series. It came standard with upgraded suspension, Muncie close ratio 4 speed transmission, power disc brakes on all four wheels, and a solid lifter 302 cu inch V8 of just under 5 litres. Chevrolet advertised the horsepower at 290 hp. But this was mainly to do with racing and insurance reasons. The true rating was closer to 360 hp. This was for the standard single four barrel carburettor. By putting on the optional dual four barrels, you were looking at 400 hp. The Z/28's popularity started to grow rapidly after GM won 10 of the 13 Trans-Am races that year and production rose to 7199 cars. These Z/28's could be supplied to customers basically as race cars with no air conditioning and other comfort trimming. Zero to 60 mph in a tire sizzling 5.5 seconds and the 1/4 all done in 13.8 seconds. The 2014 Camaro goes down the quarter in 12.9 seconds so there's not much in it. In fact it's possible that the 60's Z/28's could have even been faster than the latest ones. Current ones have all sorts of traction and stability controls plus tires that weren't even dreamt of in the 60's. So, go put a pair of rear slicks on the older one and I bet there's more than a few seconds in it. 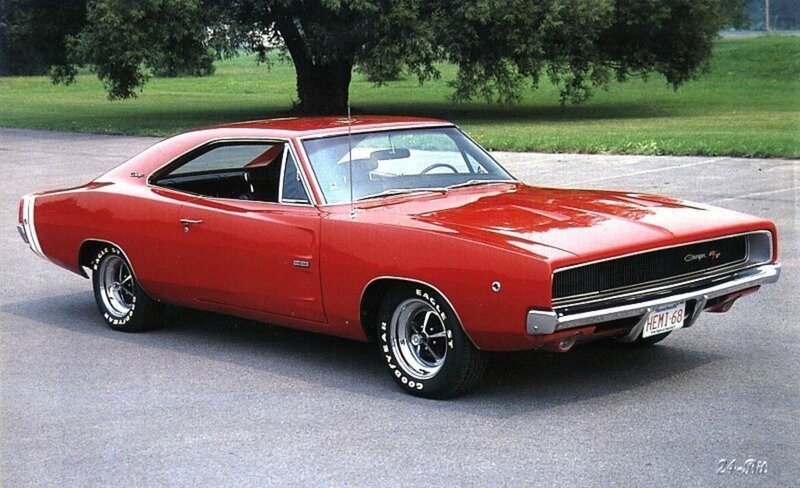 I don't think there was a cleaner design in the muscle car 1960s than the 1968 Dodge Charger. Just look at that long racked coupe roofline and such a simple squared off front with hidden headlights that just works. The most memorable car chase in movie history in Steve McQueen's Bullitt, has to be the 1968 Dodge Charger verses McQueen in the fastback 390 Mustang. Knowledgable car guys with not a lot to do have analyzed that film for decades and come up with the conclusion that throughout that chase the Charger was faster. 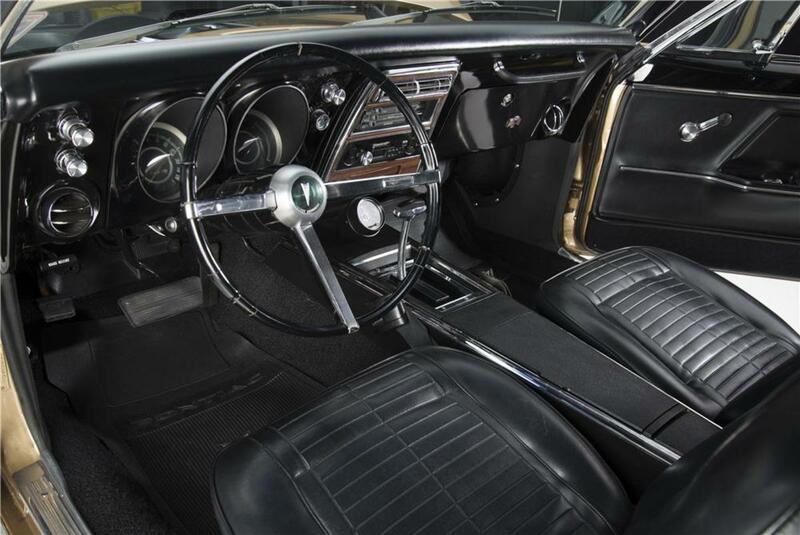 1968 was a whole new year for the Charger as they got a complete redesign. A nice quite subtle coke bottle design was grafted around the rear fenders and the rear window had a new curved in 'flying buttress' effect. Standard engine was the 318 cu inch V8 but you could get the R/T version with the 440 cu inch Magnum. 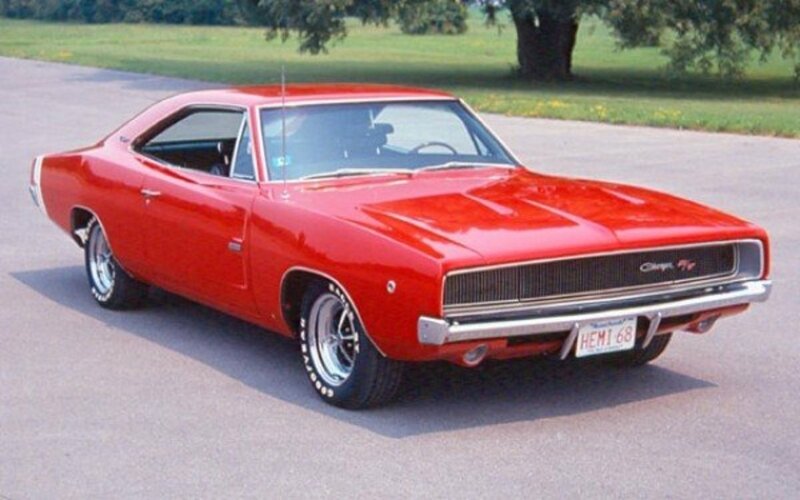 96,000 Chargers were manufactured in 1968 including 17000 R/T's. You could buy the base 318 one for a shade over $3000, or, $3480 for the R/T. The one to get though was the Charger with the 426 cu inch Hemi and 425 hp. With a four speed transmission this hit 60mph in just 5.4 seconds and would top out at 140 mph. Mind you, the economy like all 60's American muscle cars was very distant in the minds of the manufacturers. The Hemi Charger would go through 13mpg just cruising and 11mpg in town. The gas tanks weren't even that big at 19 gallons, so if you were cruising you'd have to fill that tank up every 250 miles. Below is the famous car chase scene from Bullitt. See how the Charger's got the edge on the Mustang. 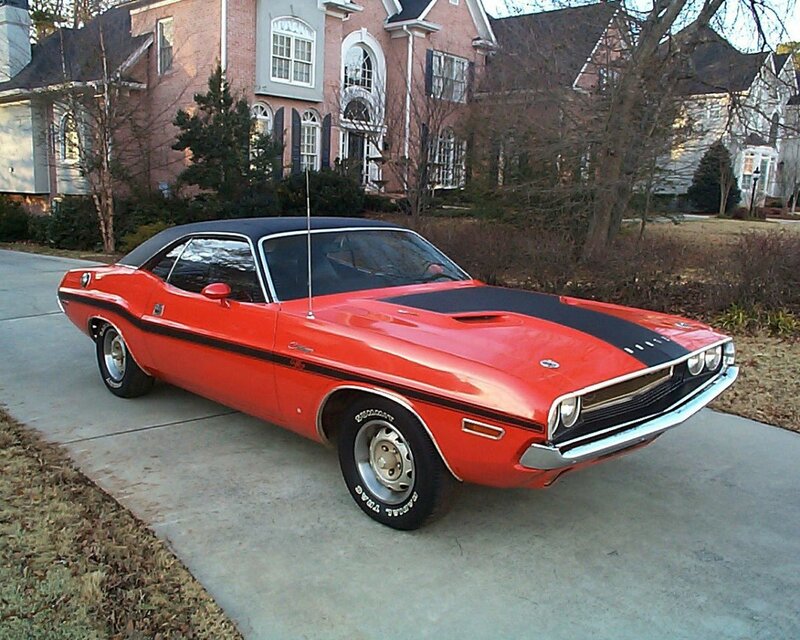 I'm going to stick my neck out and say of all the years that Barracudas were produced, 1970 was the best design and it went all the way through from 1964 to 1974. Mind you the 1966 Barracuda was a really nice looking car too with a gorgeous wraparound curved window just like the British Jensen of the same year. They were all based on the Valiant, but in 1970 Plymouth gave the Barracuda its own distinct design. 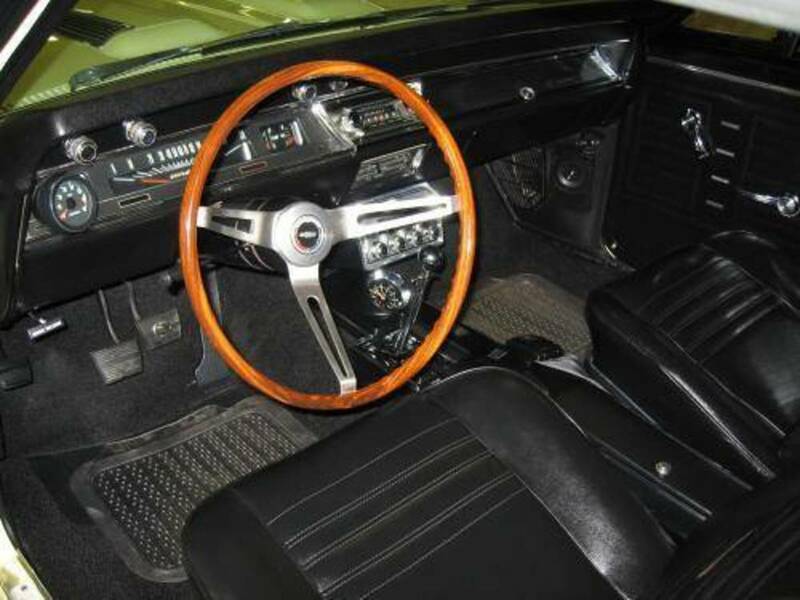 Known as The Cuda, it shared engines with the Chrysler Charger and Challenger at the time. So available V8's were from 318 cu inch right through to the 426cu inch Hemi and 440 cu inch Magnum. Although the Cuda looks remarkably like the Challenger it only shares its platform and no other sheet metal. In fact the Challenger's got a 2 inch longer wheelbase. The Hemi was the way to go with a 5.8 second 0-60mph time but costing an extra $880 for this engine option is probably the reason only 666 cars were delivered. The standard car with a 225 cu inch 6 cost $2865 so yeah another 30% extra for that Hemi would have been quite a hike. Javelins were more unusual Muscle Car's. They were built in two generations, a 1968-1970 version and a restyle for 1971-1974. Personally, I prefer the styling of the first model. A real wake up to the big three was that Javelin's won the Trans-Am series. Not just in 1971, but 1972 and 1976 - two years after they'd stopped production. AMC built them in Wisconsin, but they were also assembled in Mexico, Venezuela, Germany, and Australia. Richard Teague penned the design and it was a clever combination of both notchback and fastback. Prices started at $2742 and they only came in two-door form. Engine options ranged from an entry level straight six, but most opted for the 4.8 litre, 290 cu inch V8. Biggest engine option was the 390 cu inch, 6.4 litre with four-speed manual transmission. This made 315 hp and went through the zero to 60 time at 6.6 seconds and a top speed of 122 mph. But AMC offered a big range of dealer-installed engine performance options. These included a dual four-barrel cross ram intake manifold. High-performance camshafts. Needle bearing roller rocker arms and dual point ignition. Total production for 1968 was a healthy 6725 cars. Not large by the big three's standards, but AMC definitely stole some sales off them. 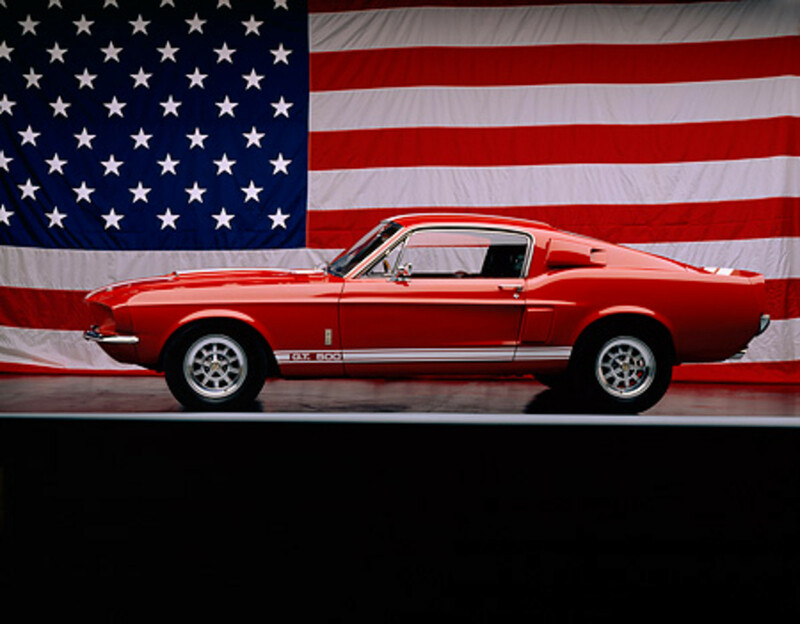 What's Your Favorite American Muscle Car From the 1960s? These were just the main models posted here. I could have included others, like the Chevrolet Impala SS, or, the Ford Fairlane GT, but to me these were just two-door versions of their saloons whereas the models outlined here were verging on sports cars. I also deliberately left out post-production models like the Shelby Mustang, the reason being that these were made in small runs and most models had their post-production makers like the Copo Camaro and Sunoco Penske Camaro. They were mainly set up around racing operations. I like the way that the big manufacturers threw safety to the wind and just dropped the biggest engines they made into these muscle cars and all at a fairly affordable price. i like them cars thoe!!! You erred as you missed the very first 2 such cars before any of these came on the scene. The Lark R2 and the Avanti R2&R3. Unfortunately the credit isn't given. in those years and still do. Expand your horizons- it's more fun! Glad you enjoyed it. I'd very much include your 63 SS as an early muscle car. That must have been great. This brings back so many great memories of how fabulous cars were back in the day. Although it wasn't a muscle car, my first car was a 1963 Impala SS.